Despite intermittent control of tracheal cuff pressure (P cuff) using a manual manometer, cuff underinflation (<20 cmH2O) and overinflation (>30 cmH2O) frequently occur in intubated critically ill patients, resulting in increased risk of microaspiration and tracheal ischemic lesions. The primary objective of our study was to determine the efficiency of an electronic device in continuously controlling P cuff. 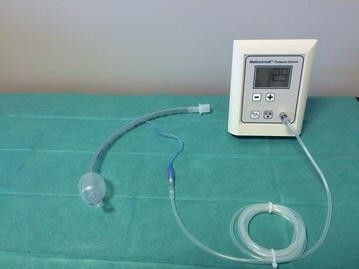 The secondary objective was to determine the impact of this device on the occurrence of microaspiration of gastric or oropharyngeal secretions. Eighteen patients requiring mechanical ventilation were included in this prospective randomized controlled crossover study. They randomly received either continuous control of P cuff with Mallinckrodt® device for 24 h, followed by discontinuous control with a manual manometer for 24 h, or the reverse sequence. During the 48 h after randomization, P cuff was continuously recorded, and pepsin and alpha amylase were quantitatively measured in tracheal aspirates. P cuff target was 25 cmH2O. Clinical characteristics were similar during the two study periods, as well as mean airway pressure. Percentage of time spent with cuff overinflation or underinflation was significantly lower during continuous control compared with routine care period [median (IQR) 0.8 (0.1, 2) vs 20.9 (3.1, 40.1), p = 0.0009]. No significant difference was found in pepsin [median (IQR) 230 (151, 300) vs 259 (134, 368), p = 0.95] or in alpha amylase level [median (IQR) 1475 (528, 10,333) vs 2400 (1342, 15,391), p = 0.19] between continuous control and routine care periods, respectively. The electronic device is efficient in controlling P cuff, compared with routine care using a manometer. Further studies are needed to evaluate the impact of this device on intubation-related complications. In spite of the increased use of noninvasive ventilation and high-flow nasal oxygen [1–3], intubation is still frequently performed in up to 85 % of critically ill patients requiring mechanical ventilation . This invasive procedure is associated with several potential complications, such as microaspiration of contaminated oropharyngeal and gastric secretions, ventilator-associated pneumonia, and tracheal ischemic lesions [5–10]. These intubation-related complications occur when tracheal cuff is inadequately inflated . Current recommendations are to keep cuff pressure (P cuff) between 20 and 30 cmH2O, using a manometer . Unfortunately, these recommendations are not followed in a high percentage of ICUs . Even when tracheal cuff is routinely monitored and adjusted by nurses, patients spend a large amount of time up to 30–50 % outside the targeted range [14–18]. Moreover, P cuff drops under 20 cmH2O each time the manometer is connected . Several new devices are available to continuously control P cuff and prevent complications related to underinflation or overinflation of tracheal cuff [20–22]. Although many devices are available on the market, few of them were evaluated and validated by well-conducted clinical studies. These devices could be classified into mechanical and electronic. The advantages in using an electronic device are its easy use and the lower cost, compared with a pneumatic device. The efficiency of the electronic device was evaluated in one in vitro study . However, to our knowledge no clinical randomized controlled study has evaluated the efficiency of the electronic device in critically ill patients receiving mechanical ventilation for more than 48 h. Therefore, we conducted this randomized controlled trial to determine the efficiency of the electronic device in continuously controlling P cuff. The secondary objective of this study was to evaluate the impact of continuous control of P cuff, using the electronic device, on microaspiration of gastric contents in intubated critically ill patients. This prospective randomized controlled crossover study was performed during a 1-year period, in a 10-bed ICU at the university hospital of Lille (France), in accordance with the Helsinki Declaration. Inclusion criteria were: age >18 years and mechanical ventilation through a tracheal tube for a predicted duration of at least 48 h. Exclusion criteria were: mechanical ventilation through a tracheostomy, enrollment in another study that might interfere with the current study results, pregnancy, and contraindication for enteral nutrition. Patients were randomly assigned to receive continuous control of P cuff with the electronic device (Mallinckrodt electronic cuff pressure controller®, VBM Medizintechnik GmbH, Sulz am Neckar, Germany) for 24 h, followed by discontinuous control (every 8 h) with a manual manometer (Hi-Lo Hand Pressure Gauge®, Mallinckrodt, Medtronic TM) for 24 h (Fig. 1), or the reverse sequence (Fig. 2). The target of P cuff was 25 cmH2O during the two periods. Randomization was performed using a computer‐generated random assignment list in balanced blocs of six. Treatment assignments were contained in sealed opaque envelopes sequentially numbered. The primary objective was to determine the efficiency of the electronic device in reducing percentage of time spent with underinflation or overinflation of tracheal cuff, compared with routine care using a manometer. The secondary objectives included the impact of the electronic device on percentage of patients with underinflation or overinflation of tracheal cuff, percentage of time spent with underinflation of tracheal cuff, percentage of time spent with overinflation of tracheal cuff, percentage of time spent with normal (20–30 cmH2O) tracheal cuff, P cuff, and coefficient of variation of P cuff, compared with routine care, and its impact on microaspiration of gastric and oropharyngeal secretions. P cuff and airway pressure were continuously recorded at a digitizing frequency of 100 Hz for 48 h (Physiotrace®; Estaris, Lille, France) , including 24 h of continuous control of P cuff using the mechanical device and 24 h of manual control of P cuff using the manometer (Fig. 3). Pepsin and alpha amylase were quantitatively measured in all tracheal aspirates during the two study periods [25, 26]. In order to avoid interference between the two periods regarding pepsin and alpha amylase levels, tracheal aspirate performed during the first 2 h of each study period was not analyzed. The engineer who analyzed the data (JDJ) and the physicians who measured pepsin and alpha amylase (FZ, PM, and MB) were blinded to study group assignment. All patients were intubated with a high-volume low-pressure PVC standard-cuffed tracheal tube. Tracheal tube size was 8 and 7.5 in men and women, respectively. During the manometer period, nurses adjusted P cuff every 8 h. Tracheal suctioning was performed, using open suction system, 6 times a day, or more frequently if clinically indicated. Semi-recumbent position was used during mechanical ventilation. During routine care period, P cuff was adjusted, using the manometer, before turning and oral care. The primary outcome was the percentage of time spent with underinflation or with overinflation of tracheal cuff. Secondary outcomes included mean P cuff, coefficient of variation of P cuff, percentage of patients with underinflation of tracheal cuff, percentage of patients with overinflation of tracheal cuff, percentage of time spent with normal (20–30 cmH2O) cuff pressure, percentage of time spent with underinflation of tracheal cuff, percentage of time spent with overinflation of tracheal cuff, mean pepsin and alpha amylase level, percentage of tracheal aspirates positive for pepsin, and percentage of tracheal aspirates positive for alpha amylase. Underinflation of tracheal cuff was defined as P cuff <20 cmH2O for >5 min over the 24-h period of recording. Overinflation of tracheal cuff was defined as P cuff >30 cmH2O for >5 min over the 24-h period of recording . The coefficient of variation of P cuff was calculated as standard deviation/mean P cuff × 100. Microaspiration of gastric contents was defined by the presence of pepsin at significant level (>200 ng/mL) in tracheal aspirate. Microaspiration of oropharyngeal secretions was defined by the presence of alpha amylase at significant level (>1685 UI/L) in tracheal aspirate . Based on previous results [14, 15], the mean percentage of time spent with underinflation or overinflation of tracheal cuff was 30 % [standard deviation (SD) = 20 %] in patients intubated with a PVC‐cuffed tracheal tube receiving routine care of P cuff using a manual manometer. The expected mean percentage of time with underinflation or overinflation of tracheal cuff using the mechanical device was 10 % (expected difference of 20 %). In a parallel-group design, n = 22 patients per group will be required to detect this difference with a two-sided test, a power of 90 %, an alpha risk of 5 %, and a SD of 20 %. In a crossover design, the sample size determination is based on SD within subject difference, which can be derived from SD of measure and coefficient correlation (r) between the two measures on the same subject . The sample size can therefore be derived from the number of patients to be included in parallel-group design, as follows: n * (1 − r). Thus, assuming a conservative value of 0.2 for r, the number of patients to include is 18. All analyses were performed in an intention-to-treat manner. Distribution of quantitative variables was tested using Shapiro–Wilk test. Normally and non-normally distributed variables were expressed as mean ± SD and median (25th, 75th interquartile), respectively. The statistical significance was set at p < 0.05. The primary outcome was compared using a mixed linear model, adjusting for the period effect. Interaction between study period and assigned treatment, i.e., continuous control of P cuff or routine care, was tested. Qualitative and quantitative patient characteristics and secondary outcomes were compared between the two 24-h periods using McNemar and Wilcoxon tests, respectively. During the study period, 23 patients were eligible. Five patients were excluded for different reasons, and 18 patients were included and were all analyzed (Fig. 4). Patient characteristics are presented in Table 1. No significant difference was found between the two study periods regarding ventilator mode and settings, sedation, Ramsay score, or neuromuscular blocking agent use. Prone position was not used in included patients, during the two study periods. All other characteristics were also similar during the two periods (Table 2). No significant difference was found in duration of P cuff and airway pressure recording [median (IQR) 23 (23, 23.3 vs 23.5 h (23, 24), p = 0.066], or in mean airway pressure [13.2 (10.7, 15.5) vs 13.1 cmH2O (10.8, 15.6)] between continuous control and routine care periods, respectively. The percentage of time spent with underinflation, or with overinflation, was significantly lower during continuous control of P cuff compared with routine care [median (IQR) 0.8 (0.1, 2) vs 20.9 (3.1, 40.1), p = 0.0009]. No significant interaction was found between study period and the assigned treatment (p = 0.91). Mean P cuff and percentage of time spent with P cuff 20–30 cmH2O were significantly higher during continuous control of P cuff compared with routine care. Percentage of patients with underinflation, percentage of time spent with underinflation, percentage of time spent with overinflation, and coefficient of variation of P cuff were significantly lower during continuous control compared with routine care of tracheal cuff. Percentage of patients with overinflation was similar during the two study periods (Table 3). No significant difference was found in pepsin level, in percentage of tracheal aspirates positive for pepsin, in alpha amylase level, or in percentage of tracheal aspirates positive for alpha amylase between the two study periods (Table 3). Our results suggest that the electronic device is efficient in controlling P cuff. However, no significant impact of continuous control of P cuff was found on microaspiration of gastric or oropharyngeal secretions. To our knowledge, our study is the first clinical randomized controlled study to evaluate the efficiency of the electronic device in continuously controlling P cuff in critically ill patients. A previous in vitro study found similar results . In addition, Lorente et al. conducted a prospective observational study to determine the impact of continuous control of P cuff, using the same electronic device, on the incidence of VAP. The authors reported significantly lower rate of P cuff determinations <20 cmH2O (mean ± SD 0 vs 9 ± 8, p < 0.001), P cuff determinations >30 cmH2O (mean ± SD 0 vs 4 ± 5, p < 0.001), and substantial decrease (51 %) in VAP incidence in patients who received continuous control of P cuff, compared with those received routine care. However, the efficiency of the electronic device in continuously controlling P cuff was not the primary objective of the study. In addition, P cuff was not continuously recorded, and the study was not randomized. The percentage of time spent with underinflation (median 9.1 %) and with overinflation (median 2.4 %) during routine care was lower than previously reported [14, 15]. The small number of patients included in the current study (n = 18) could explain this difference. Duration of prior intubation was identified as an independent risk factor for underinflation of tracheal cuff . However, duration of prior intubation was quite similar in the current study (median 4 days) compared with previous studies (2 and 5 days, respectively) [14, 15]. Another explanation could be the different patient characteristics between the current study and previous ones. The percentage of non-sedated patients was lower in the current study (22 %) compared with the two previous ones (35 and 53 %, respectively). The absence of sedation was identified as an independent risk factor for underinflation of tracheal cuff . No significant impact of continuous control of P cuff was found on microaspiration of gastric and oropharyngeal secretions. Several explanations could be suggested for this finding. Microaspiration of gastric contents was a secondary outcome, and our study was probably underpowered to detect such an effect. The higher, but not significant, level of alpha amylase during continuous control, compared with routine care periods, is in keeping with this hypothesis. Although this secondary outcome was negative, the results could be helpful for future studies, aiming at evaluating the impact of continuous control of P cuff on microaspiration. In addition, the duration of tracheal aspirate collection (24 h) during the two study periods was probably too short to evaluate this effect. Further, the above-mentioned in vitro study reported that the electronic device might interfere with self-expanding properties of some PVC-cuffed tracheal tubes . Therefore, the rapid correction of overinflation of P cuff during cough could result in short sudden drop of P cuff and microaspiration of gastric contents. Further studies are needed to confirm this hypothesis. The short washout period (2 h) used in this study might have resulted in overlap in pepsin and alpha amylase results between the two periods. Whilst pepsin half-life is relatively short , alpha amylase half-life is unknown. This might have influenced the impact of continuous control of P cuff on microaspiration of gastric and oropharyngeal secretions. Given the efficiency of the electronic device, the absence of potential harm, and the reduction in nurse workload, one could argue that use of such a device could be recommended in every intubated critically ill patient. However, the level of evidence on the clinical benefit of using continuous control of P cuff is still low . In addition, cost-effectiveness of this preventive measure of VAP was not evaluated. Therefore, further randomized controlled trials aiming at evaluating the impact of continuous control of P cuff on VAP incidence are required to evaluate the efficiency of this preventive measure. Some limitations of our study should be acknowledged. First, this was a single-center study. Therefore, our results could not be generalized to patients hospitalized in other ICUs. We did not evaluate the impact of continuous control of P cuff using the electronic device on ventilator-associated pneumonia or tracheal ischemic lesions. However, our study design did not allow such an evaluation, because each patient was his own control. This design is probably the best first step to evaluate the efficiency of the electronic device, because of potential patient-related confounders, such as tracheal size, shape, respiratory resistance, and airway pressure. Further, the study was not blinded. However, investigators who assessed continuous P cuff recording and pepsin were blinded to study group assignment. The electronic device evaluated in this study is efficient in continuously controlling P cuff in critically ill patients. Further randomized controlled studies are needed to determine the impact of continuous control of P cuff, using the electronic device, on intubation-related complications, such as microaspiration, VAP, and tracheal ischemia. AR, JDJ, MB, FZ, and SN designed the study. AR, JDJ, EP, BV, EJ, FZ, and PM collected data. JL and SN performed statistical analysis. AR and SN wrote the manuscript. All authors participated in the final revision of the manuscript and approved the submitted version. All authors read and approved the final manuscript. SN received fees from Medtronic for lecture, and from Ciel Medical for advisory board. AR, JDJ, FZ, JL, EP, BV, EJ, PM and MB: none. All data are available in the manuscript. The institutional review board of the Lille University Hospital (Comité de Protection des Personnes Nord-Ouest IV) approved the study (No. 2013-A0022540). Written consent was obtained from the patients or from their next of kin (ClinicalTrials.gov Identifier: NCT01965821).